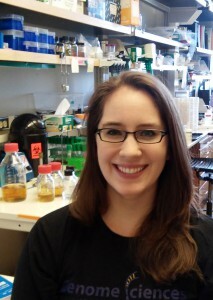 This week’s BEACON Researchers at Work blog post is by University of Washington graduate student Elyse Hope. “Remember to finish your full course of antibiotics” is a phrase we have probably all heard from a doctor at least once. Intuition tells us that a long course of antibiotics is designed to completely eliminate any pathogens from our bodies, making sure we don’t have any left over that might become drug-resistant. The information that is left out, however, is how a pathogen might evolve drug resistance. One way in which microbes (bacteria, yeast, and others) might survive an antimicrobial or antibiotic treatment is to form a biofilm, which is the trait I study in yeast. The premise of a biofilm is this: microbes can create proteins on their cell surfaces and even outside the cell, allowing the microbes to stick to surfaces and to each other in a mass (Verstrepen et al, 2004). When exposed to a stressor like an antimicrobial or other chemical treatment, cells on the outside of the biofilm may die, but cells on the inside of the biofilm might survive (Smukalla et al, 2008) and – once the stress has passed – repopulate. Drug-resistant microbes pose an increasing healthcare problem, and part of combating this problem is understanding the genetics behind antimicrobial resistance and how those genetics contribute to the types of biofilms we see. The primary goal of my research is to better understand the genetic basis of yeast biofilm formation and how the ability to form a biofilm evolves in yeast. In Maitreya Dunham’s lab at the University of Washington, I am using many different strains of budding yeast Saccharomyces cerevisiae (the same yeast that makes bread, wine, and beer) to broadly investigate the genetics underlying biofilm formation. Most of what we know about yeast biofilms comes from working with a few well-studied laboratory strains, but we haven’t known until now whether these lab strains are representative of what we would see in yeast in the wild, including strains of yeast involved in infection. Recent work from a group in France (Liti et al, 2009) generated a collection of wild yeast from different sources all over the world, from Ethiopia to Malaysia to Pennsylvania, and from wine to cactus to palm tree nectar. I wanted to know: if we look at biofilms formed by these wild strains, do we see the same characteristics predicted by laboratory strains? There are many different ways to look at yeast biofilms established in the literature, from how well the yeast stick to each other and to surfaces, to how complex they look when they grow together in a colony (Granek and Magwene, 2010; Stovicek et al, 2010). We studied five different visible traits related to biofilms in yeast and showed that most of these traits are uncorrelated. This means that whether a yeast strain can stick to other cells (trait 3) has little to do with how well it can form a “lacy” colony (trait 1) or stick to a surface (trait 5). We also found that each of these wild strains has an entirely unique set of traits, both in strength and complexity, and that the traits are different depending on whether a cell is haploid or diploid (“ploidy”, how many copies of its chromosomes it has), which is a more complex picture of the relationship between ploidy and biofilm traits than was previously known from laboratory strains (Galitski et al, 1999; Reynolds and Fink, 2001). Our next step is to look at changes in single genes and how they specifically contribute to each of these traits. My final goal is to make it possible for us to engineer strains of yeast with very specific biofilm characteristics, and to know what gene variants to look for as potential targets for small molecules. If we could find targeted ways to disrupt biofilms, then the microbes inside could be much more susceptible to drug treatments. For more, see our paper here. I have come to feel passionate about the work I am doing, and believing in the larger goal helps me meet the smaller goals of day-to-day effort. When I started graduate school, however, I had never even seen a yeast cell before. I started college with a computational background and planned to be a physics major, but genetics drew me in with its blend of logical problem-solving and real-world applications, and I declared a biology major instead. My senior year I joined a lab that had just started a collaboration with a genomics group. My PI sent me a paper about genome sequencing to see if I would be interested in going that route with my research. I had never read anything more interesting in my life; I was astounded by what had been accomplished with sequencing so far, as well as the implications for what could be accomplished in the future. I later entered a Genome Sciences graduate program so I could work on realizing those possibilities. I had every intent of focusing on sequencing and staying computational, but I had an amazing conversation with a PI who worked on yeast and envisioned a very real-world project on biofilms that would integrate genetics, sequencing, and bench work. She took a chance on me that I would love yeast as much as she did, without any experience whatsoever, and she was right. Galitski, T., A. J. Saldanha, C. A. Styles, E. S. Lander and G. R. Fink, 1999 Ploidy Regulation of Gene Expression. Science 285: 251-254. Granek, J. A., and P. M. Magwene, 2010 Environmental and genetic determinants of colony morphology in yeast. PLoS Genet 6: 1-12. Liti, G., D. M. Carter, A. M. Moses, J. Warringer, L. Parts et al., 2009 Population genomics of domestic and wild yeasts. Nature 458: 337-341. Reynolds, T. B., and G. R. Fink, 2001 Bakers’ yeast, a model for fungal biofilm formation. Science 291: 878-881. Smukalla, S., M. Caldara, N. Pochet, A. Beauvais, S. Guadagnini et al., 2008 FLO1 is a variable green beard gene that drives biofilm-like cooperation in budding yeast. Cell 135: 726-737. Stovicek, V., L. Vachova, M. Kuthan and Z. Palkova, 2010 General factors important for the formation of structured biofilm-like yeast colonies. Fungal Genet Biol 47: 1012-1022. Verstrepen, K. J., T. B. Reynolds and G. R. Fink, 2004 Origins of variation in the fungal cell surface. Nat Rev Microbiol 2: 533-540. For more information about Elyse’s work, you can contact her at ehope at u dot washington dot edu.